I love a beach book with Southern sass. That is why I’m a huge fan of Mary Kay Andrews. 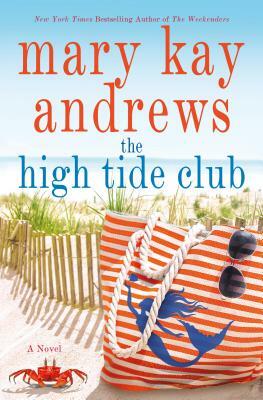 Her latest The High Tide Club is a touch different. Brooke, a young attorney, is summoned by a dying heiress. Brooke is given two tasks. One is to help protect the ninety-nine-year-old woman’s beloved island for the future. The other task is to contact the descendants of the women who were once the heiress’s closest friends–the skinny-dipping, joy loving gals who called themselves the High Tide Club. This book is about celebrating love, finding closure, and making the world right. Note to self: Mary Kay Andrews is a good summer book club discussion read. Contemporary romance writer Tessa Bailey is smoking hot right now. Disturbing His Peace is part of her “The Academy” series and you will devour this quick read. Police lieutenant Greer Burns is the ultimate professional. No one distracts him from his job—until academy recruit Danika Silva makes an impetuous mistake and is partnered with him as part of her probation. The problem is, Greer has known Danika from before and she is the one woman who can get under his skin. Great sparks! I have a pair of historical romances for your beach bag. The incomparable Mary Balogh has a new book out. Someone to Care offers Regency scandal, seduction, and an older hero and heroine. Yes, like the kids are grown and gone and the time has come for a new energy in life. Okay, maybe I’m doing some relating here, but love is love and I adore the witty dialogue in a Mary Balogh book. Valerie Bowman’s A Duke Like No Other is great fun. General Mark Grimaldi has a chance to rise to a Home Office position, but he needs a wife. The challenge is, he already has one. He and his wife have lived apart for years. Now, Nicole agrees to come back with boundaries, of course–but those things never work out. Regency second chance for love. Linda Howard is strongest when she is penning romantic suspense. The Woman Left Behind is riveting. OSRBC Austin will not be meeting in June. Their meeting date is Father’s Day and we need to give the fathers their due. Next meeting will be July 15th. Information will be posted here. The Romance Book Club at the New Central Library meets the second Tuesday of the month at 6:30 pm. They will be meeting June 12th to discuss “LGBTQIA+ Love Stories. : Great list of books at their site here.